The dark forest, lit up by fairies makes a suitably stylish backdrop image, although the realistic style is a little out of character with the simpler cartoon symbols, but we’re not complaining, as the overall look is very nice. Sitting above the reels are the 4 levels of the progressive jackpot, with the Club, Heart, Diamond and Spade prizes rising in value as a small percentage of each bet is put aside for some lucky players to claim in the randomly-triggered Jackpot Cards round. Underneath, we have the standard EGT control buttons which let players adjust their bets from just 20 coins up to a high limit of 400, while another button takes them to the pay table where they can review what each symbol is worth. Landing identical symbols across a payline, on adjacent reels from the left side will result in a win, and anyone who likes to test games before playing for real will find free Wonder Tree video pokies at many casinos. Although many pokies use the playing card symbols to fill out the bottom the pay scale, few do it in such style as this one, where the J, Q, K and A are all made to look as if they are branches of some strange multi-coloured tree. At 1-coin per line stakes, 5, 20 or 100 coins are the rewards for landing the J or Q across 3, 4 or 5 reels of a payline, while the K and A are worth 150 for full lines. The picture symbols are significantly more valuable and increase in a unique pattern, with the toadstool paying out 20, 40 or 1000 coins, while a unicorn returns the same apart from lines of 4 that are worth 50. The only difference in value with the forest elf is that he or she (hard to tell), pays 100 coins when 4 land on a line, while the red-haired fairy pays out 30, 200 or 1000 coins. The most rewarding standard symbol is a wise old wizard, and this guy is worth 50 or 400 coins when 3 or 4 turn up, but as with all picture symbols, the top payout is still 1000. This strange payout structure means that players are far more likely to see the high cards, or small lines of 3 picture symbols. A cottage in the forest is the top value symbol in this game, paying out 100, 1000, or a massive 50,000 coins when 3, 4 or 5 land across a payline, while also being able to substitute for any other if it’s then possible to complete a winning combination. Last but not least, we have the magical tree that gives this game its name, and although this smiling shrub only appears on the middle 3 reels, it can stop in any 3 positions on them to pay out a basic win of 40 coins and then trigger a free spins round. 12 bonus spins play out, during which all wins, except 5 wild cottage symbols, are tripled in value. 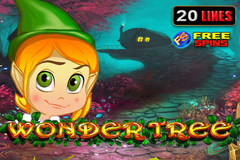 Every time the Wonder Tree appears in a free spin 2 extra games are added on to the total. There’s a couple of extras that all EGT games have, with players able to take a double or nothing gamble on any win of less than 700 coins, winning it by correctly guessing the colour of a playing card. They can then cash it out, or go again, but wrong pick loses the initial win and any gains made in the gamble so far. If the Jackpot Cards round is triggered, then players will see 12 playing cards and the first suit uncovered 3 times will be the jackpot that they win, from the small Club prize to the far larger Spade award. This attractive pokie is a bit of a safe bet for EGT, as it sticks to a popular theme and comes with decent, although not unique, bonus features. Odd pay scale aside, it’s a recommended game that has the high return to player percentage that’s expected from this reliable developer.